Before the Lone Survivor retreat I was struggling to find my way in my C-PTSD world. As a former Marine and a medically retired police officer I had difficulty asking for help when I knew something was very wrong with me. The anxiety, panic attacks, nightmares, anger, and hyper-vigilance were eating me alive. My wife told me so many times that there was something wrong with me and I needed to get help. Finally, in 2011, my wife had enough and dragged me to the doctor where I was diagnosed with anxiety and put on medication. The doctor had briefly mentioned PTSD to me at the time but I chose to ignore him figuring the meds would work on whatever everyone else thought was wrong with me. I was forced to retire from law enforcement in 2014 due to a severe shoulder injury that resulted in a permanent disability. I lost my sense of purpose, I had no desire to do anything, all the PTSD symptoms got so bad I thought I was losing my mind. Finally, in December 2016, I had the courage to go to the doctor and ask for help and was diagnosed with PTSD. 2017 was the year I battled to finally get my life back. I was in counseling, started working with a PTSD service dog, and was put on additional medications. I started eating better and working out. During one of my workouts I was listening to the Team Never Quit podcast and heard them mention and talk about The Lone Surviver Foundation. After looking into The Lone Survivor Foundation retreats I was very hesitant to apply. I wasn’t sure I could handle it. I put off applying for several months until I finally got the courage to apply. The entire application process was easy and the staff of The Lone Survivor Foundation was nice and was able to answer all my questions. From the moment I stepped off the plane to the moment I left to come home the retreat staff were absolutely fantastic. They made me feel relaxed and welcome, which definitely put me at ease and helped me relax. The facility was clean and very nice, like a high end hotel. While at the retreat I wanted to try every modality that was offered, I felt that at this point in my treatment anything that might help me would be worth trying. I tried the Equine Assisted Therapy, Yoga, Accelerated Resolution Therapy, and Neurofeedback. My favorite therapy was the Accelerated Resolution Therapy, it definitely has helped me the most. It has helped with my nightmares to a point where I rarely have any. The different modalities provided an array of tools to help me while I was at the retreat, some of which I use everyday since I’ve gotten home. Everyone I met at the retreat were amazing, the staff were fantastic and knowledgeable and you could tell they actually cared about the program. The retreat participants were all incredible people who I consider life long friends. We all share a common bond, not only being veterans but also the knowledge of the daily struggles we each face. The staff made the retreat feel relaxed and comfortable, they treated us like family. Before we left the retreat the staff ensured we were aware of many resources available to us to continue once we got home. Since returning home I can honestly say The Lone Survivor Retreat has changed my life. I’m sleeping better, I’m feeling better and am able to cope with my symptoms better. My wife and family have all noticed a positive change in me. I am actually feeling good enough that I finally feel like I am living my life again without the dark PTSD cloud hanging over my every move. I am continuing with some of the modalities I learned at the retreat, I wish the area I live in had more resources available so I could continue with everything I tried at the retreat. If you are considering attending a retreat I would highly encourage it, it will change your life in a positive way. I was scared of the unknown, of how I would be treated, scared that I was heading down another road of treatment that wouldn’t work. I am so glad I took the step and went to the retreat, my hesitation’s were dismissed within the first 10 minutes of meeting the staff, they felt like family! To all the Lone Survivor Foundation supporters, I am eternally grateful for everything that you have done for this program. Without your support myself and many others would have never had the opportunity to attend the retreat or the opportunity to gain our lives back. The modalities at the retreat were amazing and the staff was professional and caring. With the tools I learned at the Lone Survivor Retreat I am in a better place to give back to my fellow veterans. I am currently the President of a non-profit, Veterans K9 Connections, that provides service dog services to disabled veterans in Northern California. 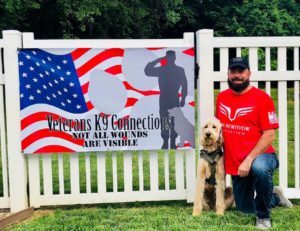 We help veterans in locating, personality matching, and training a dog to American Disabilities Act requirements for service dogs. We specialize in helping veterans diagnosed with PTSD, TBI, and other physical disabilities. Having the courage and drive to give back to my fellow veterans would not have been possible if I had not attended the Lone Survivor Retreat. The Lone Survivor Foundation has ignited my healing fire and I am forever grateful. Your story is inspirational. I’m glad you had the courage to attend the retreat and came away with tools you can use to keep healing. My husband is scheduled to attend a retreat in 2019. This article has been very helpful in explaining what to expect, setting aside uncertainties. James, your K9 program will benefit many veterans and their families. The best to you and your wife.